Philip Ross works with a mushroom farm called Far West Fungi. And on it they're growing your future house. Or at least the nontoxic, fireproof, mold- and water-resistant building blocks for it. 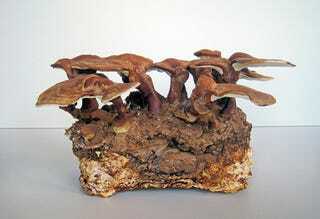 Mycelium doesn't taste very good, but once it's dried, it has some remarkable properties. It's nontoxic, fireproof and mold- and water-resistant, and it traps more heat than fiberglass insulation. It's also stronger, pound for pound, than concrete. If you doubt how strong the material is, consider this: Ross "destroyed many a metal file and saw blade" while shaping 500 of these mushroom bricks into a six foot by six foot archway. He hopes to destroy many more tools by one day building entire homes out of mushroom bricks.